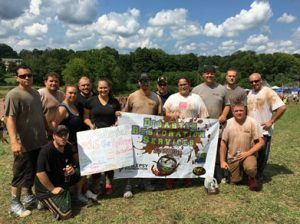 August 23, 2016 – Disaster Restoration Services (DRS), a member company of DKI, North America’s largest disaster restoration contracting organization, today announced they raised a total $2,692.50 for the Connecticut Epilepsy Foundation’s 30th Annual Mud Volleyball Tournament. On Saturday, August 20, the team met thousands of other individuals at Zoar’s Pond in Middletown for a friendly competition to help provide education and support to the estimated 60,000 people in CT living with epilepsy. Leading up to the event, DRS, along with the other 184 registered teams throughout the state, collected donations from individuals and local businesses, in the hopes of raising around $70,000 for the cause. “DRS is always thrilled to participate in events involving the community and a good cause. Mud Volleyball is a great team bonding experience, while supporting a worthwhile charity,” said DRS President Danny Strong. For more information about the foundation, visit www.epilepsyct.com. Disaster Restoration Services can take any disaster clean up from start to finish. DRS is available 24/7 and services all of Connecticut. DRS provides services for: Water Mitigation, Fire Damage Clean Up, Storm Damage Clean Up and Mold Remediation. Not only can DRS do the mitigation, but DRS can also handle the remodel. Doing Restoration Strong! For more information, visit www.drscleanup.com or www.facebook.com/drscleanupllc. The Epilepsy Foundation of Connecticut is Connecticut’s only affiliate of the national Epilepsy Foundation. It leads the fight to stop seizures, find a cure and overcome the challenges created by epilepsy, by dedicating to improve the lives of those with epilepsy and their families. For more information, visit www.epilepsyct.com or follow the Twitter handle @epilepsyct.